No other news story in 2009 can be bigger than the announcement today that the Swedish crown princess Victoria is getting engaged to entrepreneur Daniel Westling. When Expressen broke the story this morning, media and blogs have been buzzing about the rumours until the news were confirmed at about 2 PM. It was announced that the king and the government approve of the engagement, as is required by the constitution. The wedding will take place in spring of 2010 and will probably be an event of such magnitude that it will have a positive impact on the sales of tabloids and gossip magazines during the coming year or so. But the really interesting aspect from a communications point of view is that while the website of the Royal Court crashed under the pressure today, the announcement was also broadcasted via YouTube. The British Royal House has had an official YouTube channel for more than a year, but I’m still surprised that an institution as old and conservative as the royal family is able to dive in to social media in a way that most commercial enterprises are not even near yet. I’m sure it wasn’t announced on YouTube first, but either way: very well done. So, the king is on YouTube, why aren’t you? Follow blog posts about the engagement on for example Technorati (RSS) or Twitter search. Tags: engagement, victoria daniel, kronprinsessan, kungahuset, victoria, förlovning. Ping. The Swedish journalism awards were handed out on a gala event last night in Stockholm. Prizes were given in four categories and Dagens Nyheter’s Fredrik Strage won the Innovator of the Year category for his list called “The 100 biggest rock moments on YouTube”. The number one moment was a concert with The Cramps in Napa State Mental Hospital in California, June 13 1978. – At least 30-40 percent of the video clips on the list are there on the initative of readers who have influenced me and given me tips, said Strage in DN. Strage is always an entertaining writer and one of the leading music journalists in Sweden. Unfortunately I haven’t paid much attention to his Youtubiana list, but others have. Most of the blog links to the list comes from competing daily Svenska Dagbladet who even copied the format with its own top 33 YouTube moments from the political scene. And I like how SvD have been entirely transparent about where they got the idea – “this is a concept we stole from Fredrik Strage but applied on our favourite topics”. Today SvD congratulates Strage, adding (tounge-in-cheek) that it must mean that the SvD blog is the winner in the rip-off of the year category. So you can say there has been progress in a journalistic sense on several levels. Not only that the award goes to a journalist who uses the readers to co-create the content, it is also purely online based content. On top of that, a few years ago you would never see a competing paper copy a concept like that and then openly give credit back to the original, with links and all. Something truly has happened to journalism. Tags: journalism, youtube, fredrik strage, youtube. Ping. YouTube yesterday launched local sites in nine countries: Brazil, France, Ireland, Italy, Japan, Netherlands, Poland, Spain and the UK. The video site will also be adding sites in more countries within the coming months. 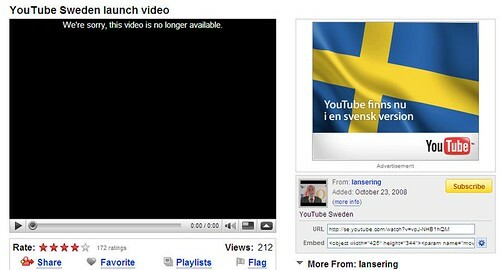 The domain www.youtube.se was registered on June 4, 2007 so if that’s any indication Sweden might be up next. Tags: video, youtube, youtube, video. Ping. Blogs are fairly easy to monitor and there are a number of free tools available. Next things to watch are wikis, social networking sites, Second Life, YouTube etc that need to be on PR executives’ radar.